It’s hard enough losing weight, but it’s even harder having to give up many of the foods you love. That often includes desserts, because they’re loaded with fats and unhealthy calories. Author Carolyn Hansen, who created the 50 Raw Desserts book, says otherwise. 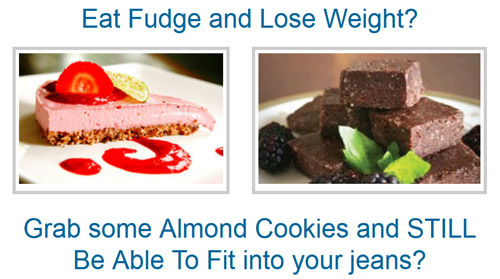 She says that you can lose weight and enjoy eating desserts at the same time if you follow her recipes. The recipes in 50 Raw Desserts are free of added sugar, free of added fat, and gluten-free, too. Not only that, but every one of the 50 recipes is also cooking-free. That’s right; no cooking! That sounds pretty tempting, so I thought I’d check it out. I happen to have a gluten issue, so anything that’s gluten-free is right up my alley. Is 50 Raw Desserts a scam, or does it deliver what it promises? Read on for the full 50 Raw Desserts review. 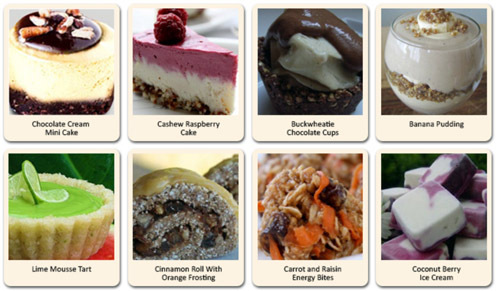 50 Raw Desserts is sold as a series of downloadable ebooks in the PDF format. That’s convenient, as you can download your books immediately after purchase without having to wait for delivery via mail. Not only that, but PDF books are portable and can be read on any computer device, including tablets and smartphones. Of course, if you want, you can also print out 50 Raw Desserts if you find that working from a printed recipe works better for you. For starters, the name of the product, 50 Raw Desserts, is somewhat misleading. In fact, you get two books of dessert recipes that contain 50 recipes each. So you’re really getting 100 recipes. Volume 1 of 50 Raw Desserts runs 43 pages and volume 2 runs 34 pages. The bonus book, Best Healthiest Breads Ever, runs 59 pages. This is the part of the review where I usually give you a breakdown of the chapters in 50 Raw Desserts and the overall contents, along with an overall description of whatever the book is about. I can’t really do that here, because none of the three books have any contents to speak of, other than the recipes themselves. They’re just cookbooks, rather than weight loss plans. That’s not criticism, Carolyn Hansen didn’t claim the book was a weight loss plan. She just said that the books were a collection of gluten-free, sugar-free, fat-free recipes. They are gluten free. Whether they’re sugar free or fat free sort of depends on how you define those terms. It’s true that none of the recipes require any traditional fats. You won’t see any recipes that call for butter, margarine or shortening. Many of them do call for ground nuts, however, and a few call for coconut oil. Nuts and coconut oil do contain fat, so just be aware of that. You also need to be aware that while none of the recipes call for added sugar, most of them do call for some sort of chopped fruit. Fruits contain sugar. That’s not to say that the recipes aren’t tasty or healthy. Just be aware that while they’re gluten-free and won’t require any cooking, they will contain calories. That means that you cannot start creating a bunch of desserts from 50 Raw Desserts, eat them all day long and expect to lose weight. Like anything else in life, these tasty recipes are intended to be enjoyed in moderation, along with part of a healthy diet and a lifestyle that includes regular moderate exercise. Combined together, these things should help you lose weight. 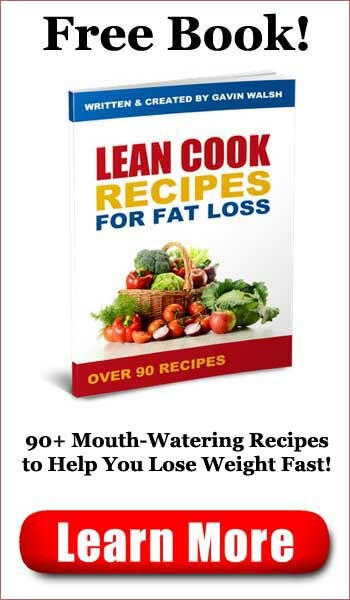 The recipes are tasty and they are easy to make, and 50 Raw Desserts should appeal to people who like raw cooking. Carolyn does a good job of creating “cakes,” “pies,” and “cookies” that don’t require any cooking and which make clever use of substitute ingredients to compensate for things that are missing that you would ordinarily find in desserts to give them that fatty mouth feel. One cream pie recipe, for example, uses an avocado, of all things, to give the cream filling the right texture that a cream pie filling should have. There are 100 recipes in all, and they’re all easy to prepare, usually consisting of nothing more than mixing things, chopping things, grinding things and stacking things. The recipes are, as described, gluten-free and free of added sugars and traditional fats. And you won’t be putting anything on a stove or in an oven. Many of the recipes for breads and crackers use sprouts, whole grains and vegetables, and require that you use a dehydrator rather than an oven to “cook” the bread. The recipes consist largely of things you’ll have around the house, and many of the recipes are also gluten-free. While the recipes in all of these books are easy to prepare and appear to be quite tasty, I was a bit disappointed to see that the recipes aren’t really collected in any sensible order. It’s not as though there was a chapter for cakes, a chapter for cookies, and a chapter for pies. Instead, the recipes are all just listed in the book in somewhat of a random order, so you’ll have to look through the table of contents to find what you’re looking for. In the case of the Best Healthiest Breads Ever book, there is no table of contents at all, making navigating the book a bit difficult. That said, the recipes look easy to prepare, tasty and healthy, and that’s what the author promised. If you have a gluten-free diet, you need to restrict sugar and/or fat intake, or you just want to experiment with raw cooking, you’ll love 50 Raw Desserts. The book is well written, covers a wide variety of types of desserts, and makes clever use of natural and raw ingredients to simulate the not-so-healthy ingredients that you usually find in such recipes. 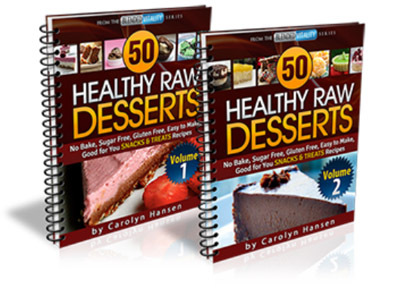 If you like to cook and you like to eat desserts, you’ll love 50 Raw Desserts. 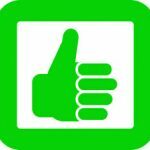 Click here to visit the 50 Raw Desserts Website. 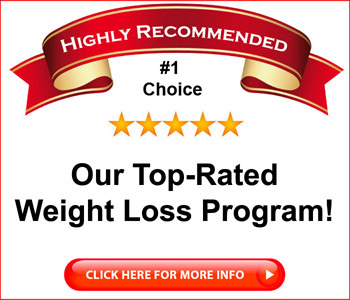 Fat Shrinking Signal Review - Weight Loss in 10 Minutes a Day?